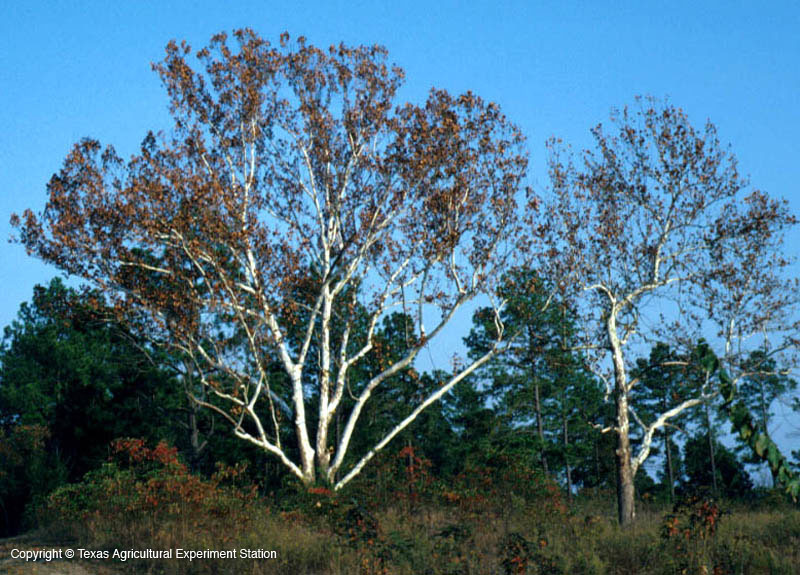 Sycamores are majestic deciduous trees native to bottomland sites in the eastern two-thirds of Texas. They are valued for their large maple-like leaves and massive, platy white, tan, and brown trunks. Sycamores prefer deep, rich and moist soils, although they will tolerate a wide variety of other soil conditions. However, they stress easily in hot dry summers. Although beautiful in their native settings, their use is limited as street trees or in landscapes because of their large size, tendency to drop leaves, twigs, and fruit, and sickliness in poor, dry sites. Width: 50 to 70 ft.